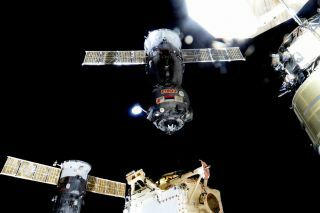 A Soyuz capsule (not the one that sprung a leak on Aug. 29) departs the International Space Station in 2015. NASA hasn't yet commented on what might have caused the 2-millimeter (0.08 inches) hole, which resulted in temporary and minor depressurization before astronauts successfully patched it on Aug. 30. But according to TASS, a Russian news agency, Dmitry Rogozin — head of the Russian space agency, Roscosmos — tentatively blamed human error that would have taken place on the ground, before the Soyuz capsule's June launch. "We are considering all the theories. The one about a meteorite impact has been rejected because the spaceship's hull was evidently impacted from inside," Rogozin said according to the TASS report. "However, it is too early to say definitely what happened," he said, according to TASS. "But, it seems to be done by a faltering hand … it is a technological error by a specialist. It was done by a human hand — there are traces of a drill sliding along the surface. We don't reject any theories." According to TASS, Rogozin continued by calling for an investigation into the incident. "It is a matter of honor for Energia Rocket and Space Corporation to find the one responsible for that, to find out whether it was an accidental defect or a deliberate spoilage and where it was done — either on Earth or in space," he said, according to the news agency. If the theory that the hole was created by a human with a drill is true, it would make it more likely the damage was done on Earth, because drilling is extremely difficult in microgravity environments. That suggests the damage may have first occurred during the capsule's manufacture or during prelaunch testing. Email Meghan Bartels at mbartels@space.com& or follow her @meghanbartels. Follow us @Spacedotcom, Facebook and Google+. Original article on Space.com.